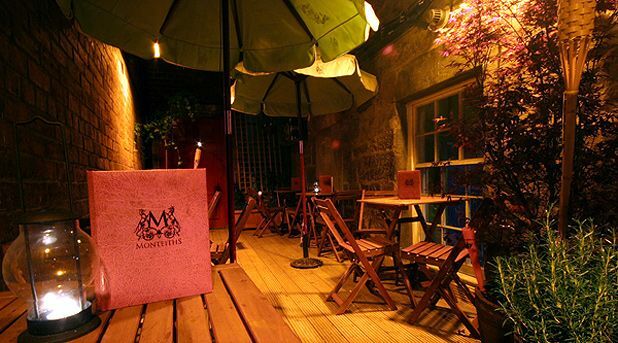 Hidden from view down a historic close off the Royal Mile, Monteiths is reached by a narrow path, framed by twigs and illuminated by twinkling lights. There are stairs up to the main area which features a cocktail bar that's popular with late-night drinkers. Given its location, tourists occupy several of the restaurant tables on a typical night. However, there's also a loyal following of regulars, attracted by the quality of cooking from a kitchen that has been turning out brasserie staples using quality local produce for more than a decade. Starters include mussels in a white wine sauce, but the chef raises the dish a notch by adding fennel and pig cheek. For mains, high-end fish dishes such as lobster and monkfish jostle with steaks and other meat options. Roast chicken is simply prepared but combines with mushroom and a rich peppercorn sauce to form a flavour-packed dish; sides are extra though. To round off the night, an individual lemon tart with ice-cream and crushed meringue is a perfect mix of textures and flavours.